TROIS-RIVIERES, QUEBEC (August 14, 2012) – Sage Karam found himself standing on the top of the podium following Sunday’s Star Mazda Championship race in Trois-Rivieres, Quebec. The rain drenched 17 year-old make quick work of the leader, following a red flag condition to change over to rain tires. Karam was in 2nd place when the skies opened up and caused the red flag. Upon returning to green flag racing, Karam made his move on the 2nd lap and pulled away from the field to capture his road course victory for Andretti Autosport. “I knew once we were going to rain tires, I had a real shot to win. For some reason, we were struggling with a problem coming off of the turns, like a lack of power or a hesitation, all weekend. The leader would pull me off the turns and it was frustrating. The boys at AA will locate the problem this week I am sure. The rain masked the problem and saved the day,” said Karam. 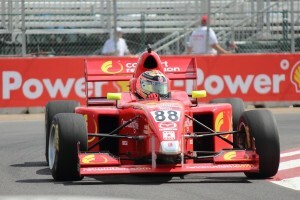 The victory was Karam’s fourth in the series and moves him into 2nd place in the Star Mazda Championship point standings. He was the youngest competitor in the race and the victory marks his eighth podium in the last twelve races. “We are for sure on a hot streak right now and I couldn’t be more excited heading into the Baltimore GP (Sept 1st/2nd) with the way things are going. It’s hard to believe that the leader and I both have eight podiums each”.